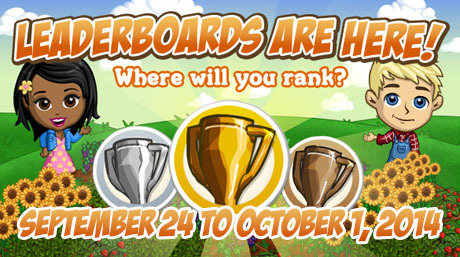 Here are the details for the FarmVille Leaderboard feature that will run from September 24 to October 1, 2014. This will serve as your guide if you are planning to participate. This feature usually gives farm support items and the tasks is not that difficult. Bushels: Ghost Cream Bushel, Pumpkin Orange Bushel and Red Maize Bushel. Harvest Jack-O-Tomato (Limited Edition Crop) to get to the top of the list! Make Colored Handbag to get to the top of the list! 2 min to make and it will need Autumn Leaf x2 and Wrist Band x1. Make Ghost Costume to get to the top of the lists. 1 hour to craft and will need Ghost Cream Bushel x3, Pumpkin Orange Bushel x3 and Red Maize Bushel x3. View current months Leaderboards Challenge HERE. View last months Leaderboards Challenge HERE.